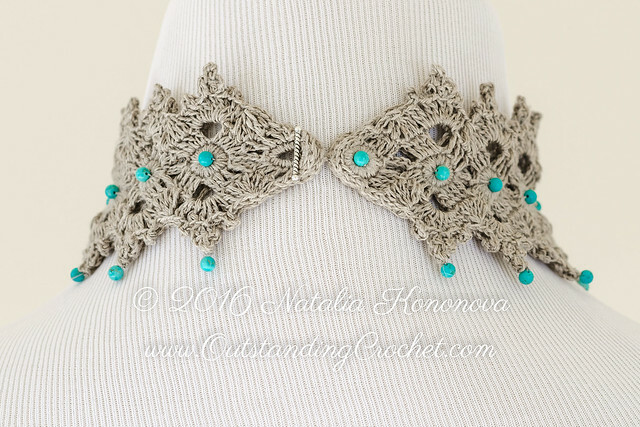 Outstanding Crochet: Celtic Choker Necklace Crochet Pattern - Addition to Celtic Bracelet - New pattern in the shops. 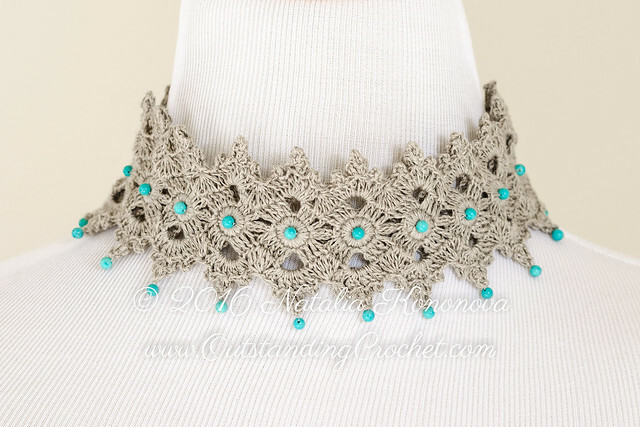 Celtic Choker Necklace Crochet Pattern - Addition to Celtic Bracelet - New pattern in the shops. This new piece of fiber jewelry was added to my patterns shop. I also finished and sent a skirt pattern to the magazine. Remember, spring will come, it will come and we need new jewelry! 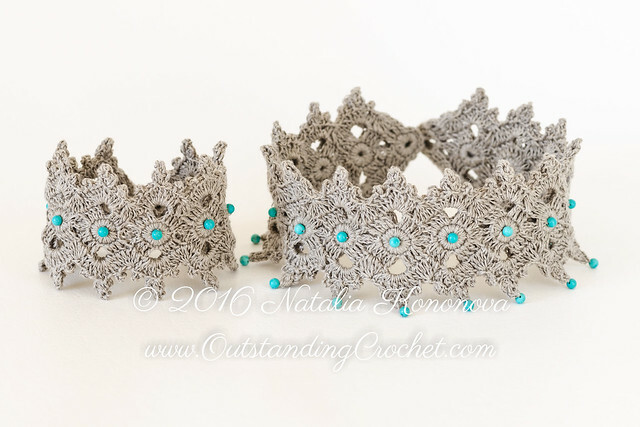 Crochet Choker Necklace and Bracelet/Wide Wrist Cuff Set Pattern. Choker Necklace and Bracelet Set Pattern. Influenced by Celtic ornaments this set is an attention magnet. Fiber jewelry is soft unlike metal. Please, note: bracelet and necklace patterns are also available separately. - matching color sewing thread, tapestry needle, hand-sewing needle, optional - stitch marker. - one button adds 7/8'' (2.3 cm) in length; add or eliminate buttons to make your own size. - necklace width is 2-3/8 '' (6 cm). - bracelet width is 6 cm/2-3/8''. Visit www.OutstandingCrochet.com and follow by e-mail to receive free patterns, tutorials and new patterns in the shops announcements! - It is not allowed to sell finished items based on any of my patterns without permission. 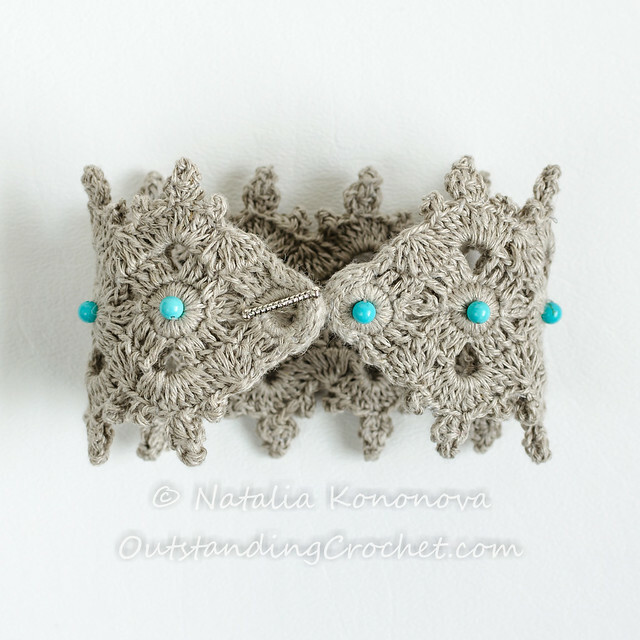 - Please, do not share my pattern as it takes a lot of hard work and time to learn skills, required for designing, writing, photographing and putting together crochet patterns. Copyright violation is not a victim-less crime! 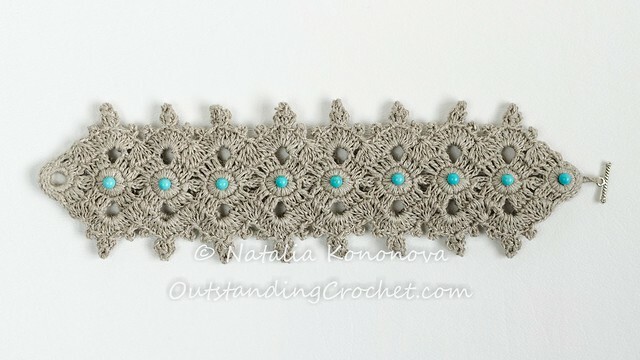 - All photos and diagrams are copyrighted and all rights to this pattern are owned by Natalia Kononova. - Do not copy, share, resell, or forward this pattern to anyone. No part of this work may be reproduced, transmitted or published in any form or by any means without prior written permission. - This material can not be used for any type of mass production/ manufacturing! - Use of any photo or video material or link to a photo for commercial purposes that belongs to Natalia Kononova is strictly prohibited. - All rights reserved. All documents are the property of Natalia Kononova. No part of this publication may be reproduced in any form or by any means. It is strictly prohibited to use my patterns for commercial purposes. - You are not allowed to sell finished items based on this pattern. Наташенька, привет. Суперский комплект! С Новым годом! Пусть в новом году у тебя и твоих любимых будет здоровье и успех! Обнимаю. Спасибо, Эльвира! И твоей семье тоже здоровья и процветания! These are simply gorgeous Natalia!